Here in the U.K. coffee shop chains have exploded in recent years, with a single high street or shopping centre now boasting several outlets selling cappuccino, mocha and latte coffees, to name but a few. Add the cold drinks, soft drinks and smoothies to the mix and the combinations available can be bewildering. No cream, half-fat, double shot - you name it, the baristas can make it. There is an argument along the lines of 'a cup of coffee is just a cup of coffee, and I'd rather save the £2.50 and have a drink at home'. It could be the case that many people agree with that statement, although I am willing to bet that it wouldn't be too hard to find an equal number disagreeing. Why are we in love with paying for steamed milk, froth and chocolate sprinkles, though? The answer, I would venture, doesn't always have much to do with the drink served up. The other day I was in a lift with several other people when I overheard a lady on the phone say to her conversation partner, "no, don't tell me now, let's meet for coffee later and you can tell me all about it". And there it is. When this lady buys herself a warm drink at the end of her working day, it is not only the beans or the cream she is buying, but the conversation and the friendship; the connectedness and the sharing of news. Conversations, whether they be deep and meaningful or lighthearted and frivolous are the glue which hold our relationships together. Sometimes there is a crisis which needs addressing, while at other times it is just good to catch up with the gossip and to touch base with someone we haven't connected with in a while. Sharing a drink (or a meal, but a drink is often quicker), provides nourishment for the spirit as well as the body and has value that cannot be overestimated. As we share our macchiato, we also share our lives, our hopes, our fears and our plans, as well as using the opportunity to work out just where we are with the many issues that may be facing us. As a professional counsellor, I have come to learn the huge benefits of letting others into our lives, to help out when we are feeling low and to provide that listening ear when the world seems bleak. 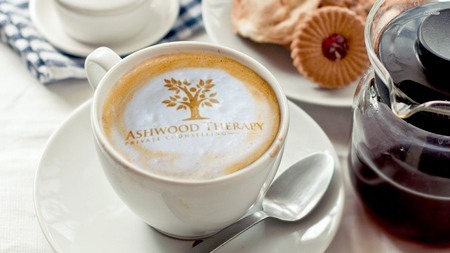 Although the online counselling clients I see at Ashwood Therapy are not in the same room as me (and sometimes are not on the same continent! ), the connection we share for the therapeutic hour is as real as it would be if we sharing the same booth in a coffee house. Oh - and if clients want to have a mug of their favourite drink next to them as we collaborate in the session, then that's just fine with me.